Crusaders stalwart George Whitelock is off to play his rugby in Japan at the end of the Super Rugby season. 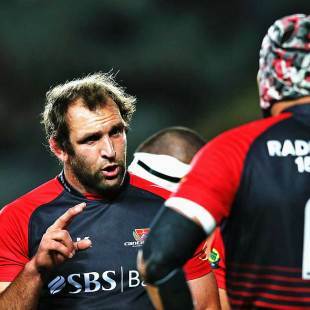 Flanker Whitelock, 28, has signed an initial one-year deal with the Panasonic Wild Knights, Crusaders and Canterbury management confirmed on Tuesday. Crusaders coach Todd Blackadder said Whitelock was a legacy player. "George's contribution to red and black rugby cannot be underestimated. He is a workhorse, a leader and a highly respected member of the team." Whitelock first played for the Crusaders in 2008, the first of the three Whitelock brothers, Adam, Sam and Luke, to do so. Canterbury coach Scott Robertson said Whitelock was the only player to captain a side to five successive national provincial titles. "That is something for George to be immensely proud of, just as we are proud of him," Robertson said. "He has played such an important role in this team's success, but he has also just been a pleasure to work with." Whitelock's one Test for the All Blacks was as a substitute against Italy in Christchurch in 2009, where he scored a try in the 27-6 win.